Because no one should have to fight alone! Our Sunflower Friends mission is to make a positive impact in the lives of the critically ill and their families. We will accomplish our mission by investing financial, emotional and spiritual support to those we sponsor. As a result, we will glorify God by reaping a harvest of love, hope, and peace in an otherwise defeating situation. 4 Man Scramble event with $1,000 going to the top team. All participants will enjoy gift bags, raffles, door prizes and a chance to be drawn for our 1 Million Dollar Hole-in-One Contest! Come join us for our second annual Roll the Dice event for Our Sunflower Friends. This evening was an incredible success in 2017 and tops off our 4th Annual Family Festival. Come enjoy a night of great music, amazing foods, and all the games you know and love from your favorite casino atmosphere. Each registrant will receive $500 in Casino Cash! In addition to the gaming, we will have some great food and a amazing music! In addition to a great time, you can enjoy knowing that 100% of all proceeds will go to support our sponsored Sunflower Friends Kids. An incredible day filled with games, entertainment and incredible support for our sponsored kids. All families and children are welcome and encouraged to attend. This event only gets larger every year and we look forward to this year continuing our growth trend and being our largest event yet. THANK YOU FOR CONSIDERING A DONATION TO OUR SUNFLOWER FRIENDS! Our Sunflower Friends is a 501c3 organization and operates entirely off of donations and fundraising events we hold for our kids. 100% of all net proceeds go directly to our sponsored kids each year. No donation is too big or small, as every dollar counts. 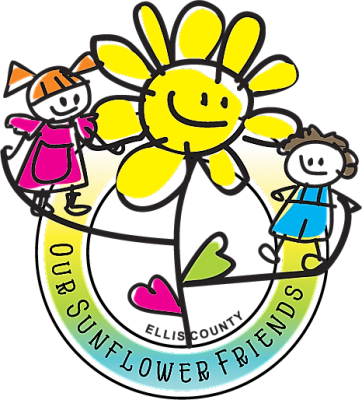 You can rest assured that by donating to Our Sunflower Friends you are helping to make a direct impact in the lives of local children throughout Ellis County.